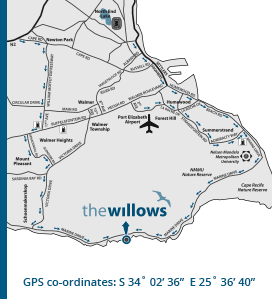 The Willows Holiday Resort & Conference Centre is located just 15 km from the Port Elizabeth beachfront in the beautiful, malaria-free Eastern Cape. 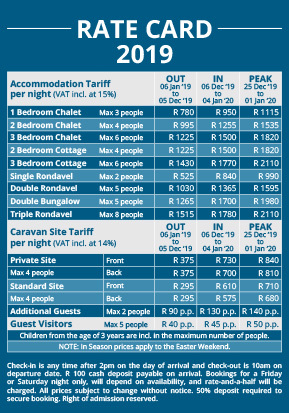 The resort offers three-star graded self catering accommodation units, a large caravan park, private camping sites, as well as conference, function & wedding venues. Situated only a few meters from the beach, on the “wild side” of the Port Elizabeth coastline, The Willows is a fisherman’s dream with rugged, rocky outcrops, and a child’s paradise with endless rock pools to discover and explore. The small, private beaches with tidal pools are perfect for swimming and lazing in the sun. For those looking for a little more action, there is a wide array of games and activities in the resort, as well as in and around Port Elizabeth. The facilities & services inside the resort will guarantee that you have everything you need on your holiday or breakaway. Strict access control, and patrolling security guards, ensures complete safety and security for you and your possessions. If you are looking for peace, tranquillity & loads of family fun, while still being close to all the attractions and amenities of a big city, look no further. 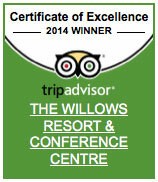 Overlooking the Indian Ocean, The Willows Conference & Events Centre is a venue with one of the best views in the Bay. This creates the perfect backdrop to make your wedding, function or conference a very special & memorable event. Services provided include catering for all occasions, venue & equipment hire, teambuilding packages, function & wedding reception decor & setup.